Good morning. I am a new receptionist and typist at the biggest law firm in our city. My goal is to be a paralegal, so I spend lots of spare time observing, reading, and preparing to take the NALS ALP exam. My boss is out of town and our caseload is being monitored by a paralegal in our office until he gets back. Today we had several people come into the office to meet with various attorneys and paralegals. I recognized two of these visitors and, of course, spoke with them in the lobby. I know I need to report to my boss if I know anyone who comes in the office. Since my boss is out of town, whom do I need to tell that I know these people? That is a very good question because that can be a difficult situation. Reporting you know visitors to the office is one of the first things you should have learned as a receptionist. In this case, you will need to report to your paralegal supervisor as soon as possible that you know the visitors. If the paralegal is not available, report this to the office manager or human resources director as soon as you can. The point is to keep the client’s information confidential, so do not be offended if you are not allowed to work on their case. Imagine if you were in their shoes. Confidentiality is of utmost importance for all legal personnel. See Rule 1.6, Confidentiality of Information in the American Bar Association’s Model Rules of Professional Conduct. A lot will be expected of you and you can rise to the occasion. 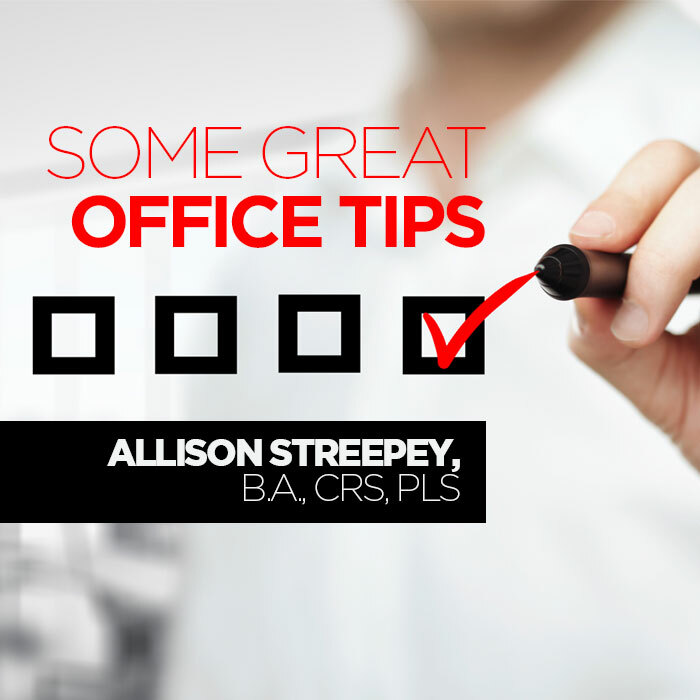 Get ready to learn how to do almost anything in an office setting. It is a fine place to learn and grow as a professional. Always have paper and pencil in hand because someone may have a request and you have a lot on your mind, so write everything down! Go to the boss first—for everything. If you find a problem, before complaining, think of some solutions to present to the boss. The same process will work for opportunities. Keep your sleepless nights and other woes to yourself. If you are constantly complaining or making excuses about the little things, it adds up. You might be pegged as unreliable. If you leave your current position, the best thing to do is not to burn bridges. You do not really know how many people your coworkers know who could affect your career. Always do the important things first. Keep good notes in your file and in your “brain.” The “brain” is your personal office manual of how to do everything. It should include the employee manual or employee memos and human resources policies. It could be a binder or in an electronic folder. It is really great to have one—especially if there are tasks that you handle infrequently. Always dress appropriately even on casual days. Find out if there is a dress code. If there is not or when in doubt, keep it covered. You will be comfortable and so will everyone else. To improve writing, read a lot and write as much as you can. Take a little time at the end of the day to plan for the next day. Planning time is never wasted. It avoids indecision and chaos. If you make a mistake, own it and get with your boss immediately on how to resolve it. Mistakes really increase the capacity to learn. Mistakes will occasionally happen, so always do your best and do each task with great care. Expect conflicts. Try to rise above personal issues and deal with the task at hand. It is not so much what happens but how you deal with it that matters. When you get to work, smile and say “good morning.” If you do not feel well, either stay home or act like you are glad to be there. This pays the bills, you know. Be glad to have a job. If you do not like it, spare others your misery and leave. Look at your company’s website or other marketing materials. Learn everything you can about where you work. Ask a lot of questions—about anything. It is better to find out on the front end when taking on a project than it is to mess it up and have to go back and correct it. Asking for instructions first and being sure you understand them will make the process much easier. Self-management and self-control are highly valued skills. It is called professionalism. At a certain point, we are all expected to act as adults. You know what that means: do the right thing. It may not be fast or easy, but do the right thing. Face it, you are not going to like everyone and everyone is not going to like you. You are both at work to do a job. Focus on the job and be civil. Remember, they may be your boss one day. Remember, attitude is everything. You never know who you will meet or what you will be asked to do. Answer with enthusiasm and curiosity. Loving to learn will take you a long way in your life. Keep track of special projects that you do to use for résumé building. Remember, in legal work, never talk about the cases in your office. Confidentiality always comes first. Keep a file of emails, letters, and notes from people thanking you for a job well done. This is a good thing to read when you need a boost. That old adage is true: be nice to everyone on your way up because you will see the same folks on your way down. It just makes good sense to be nice to everyone anyway. It makes for a better world. Remember to back up your documents and always have a contingency plan. Anything could happen and does from time to time. Be ready. Take advantage of professional development opportunities that are offered in your office. These opportunities are provided to the employees for a reason: they want you to be the best you can be. Look for skills that you can strengthen. Make a list of what you want to learn. Watch for opportunities to arise in a class, seminar, or online to achieve these goals. When you have that rare moment of “down time” at work, you could take a webinar or read a chapter of a book. Keep your desk and files in order. This may seem obvious, but this act will help keep your mind clear as well. At least clean your area on Friday afternoons as the last task of the day so you can come in fresh on Monday. Can you think of some more? If so, I challenge you to write an article about them. You could take one idea and expound on it or tell us some history about it or how you came to learn about it or use it. Every day is what you make of it, so try to make it a great one! Allison holds a Bachelor of Arts degree in Arts and Humanities from the University of Arkansas at Little Rock and graduated with honors. She is nationally certified as a Professional Legal Secretary from NALS…the Association for Legal Professionals. Allison holds UAMS Certifications in Grants Management and as a Research Specialist. Currently she is the Department Business Administrator for the office of Educational Development. She is the only person on the UAMS campus who has experience in pre- and post-award grants management (College of Nursing and Educational Development), grants administration for UAMS (Office of Research and Sponsored Programs), and served as an Institutional Review Board (IRB) Administrator. This is her 10th year as a member of NALS and every year gets better with more NALS Pals and more challenges. Allison is a member of the NALS Editorial Board and loves working with the board members, finding attorney authors, and encouraging other writers. Above-referenced. If your communication has a “re:” line, and later in the letter you say “In the above-referenced case,” the reader has a tendency to have their eyes drift back up to the re: line and then back down to re-find their place. Instead use the re: line, but if you refer to it again, say “In the Smith v. Jones case” so your reader does not get interrupted from your message. Under separate cover. If you are sending something else separately, say “I am sending you separately (or by FedEx, etc.)." Please note that. This phrase is unnecessary. You do not need to ask them to note something; just tell them and they are smart enough to at least mentally make note of it. Please do not hesitate to contact me. What you are asking them to do is to call or email you, so say “Please call me” or “Please contact me” (giving them the option for the most convenient method for them) instead. Speak in correspondence (letters and emails) more like you would speak on the telephone and much less formally. Your clients and coworkers already know you are intelligent. Speaking in such a formal way does not make you any more intelligent. Ease up and be less formal so your reader does not have to wade through a bunch of stuff that is unnecessary to get to your message. Make it easy for them (and you) by using less formal language in your communications. 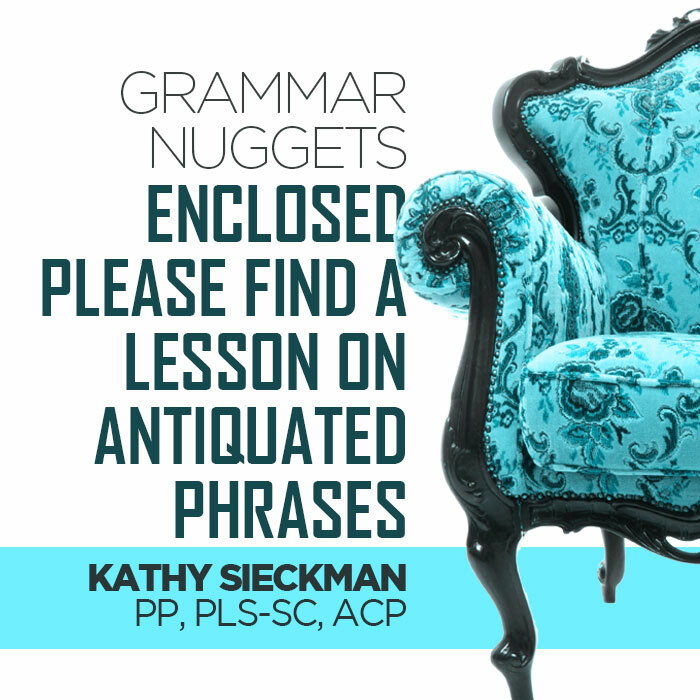 Kathy Sieckman, PP, PLS-SC, ACP, has been a member of NALS for over 30 years, is the current President of NALS of Phoenix, and is the Vice Chair of the NALS Editorial Board. Kathy is currently the Administrator-Arizona for Sacks, Ricketts & Case in Phoenix, Arizona. Kathy earned her Associate of Applied Science degree in Legal Assisting (with distinction) from Phoenix College. In her spare time, when she is not spending time with her husband, two kids, and seven grandchildren or celebrating something with friends, Kathy writes a blog on proofreading tips at http://proofthatblog.com. The purpose of an interview is to find the best candidate for the position. It is a weeding out process. Companies use a number of different methods to achieve this. Even with preparation, interviews can be nerve-racking because you never know what will be asked or required. Being able to recognize the different types of interviews might help you to be better prepared. Sometimes in one-on-one interviews, the interviewer might be looking for someone like themselves. It is a dangerous thing to only hire people in an organization who talk and look alike. There is little or no room for diversity, and this is often referred to as “mirror hiring.” If the person is just like you, the company might be missing out on an opportunity to bring in someone with new and innovative ideas. For many, panel interviews are nerve-racking. They consist of two or more interviewers and the goal is to get as many people involved in the hiring process in order to make better hiring decisions. Each person in the group or panel plays an important role and is looking for the best match. They all have different perspectives and questions that will be integral in the decision-making process. This process allows a number of different people to be a part of the interview process and make unbiased decisions. While panel interviews can be stressful, it is important to be yourself in any situation. Be as honest as possible and ask questions. This might be a great opportunity for multiple people to see how you communicate and interact when placed in a group. The panel or group interview may be your second interview and the last opportunity you may have to prove yourself. Group interviews generally consist of a couple of candidates being interviewed at the same time. This is even more nerve-racking than being in a panel interview because your competitor is sitting next to you and you can hear each other’s responses. If you mess up, not only will the interviewer know, but the other candidates will as well. It is important to relax, be positive, and stand out from the competition. The goal of the behavioral interview is to use past performance to predict future performance. They want to see if you have the right competencies to be a good fit for the position. The questions are normally structured around situations you have had to deal with in the past. These questions provide the interviewer more information into the candidate’s thought processes. Tell me about a time you had to deal with a difficult client. Please give me an example of a time you had a conflict with a coworker. How did you handle it? Tell me about a time you failed and/or struggled on the job. What did you learn as a result of that? What did you do to overcome it? Give me an example of a time you led a project at work. How many people did you lead and what was the outcome? How has your education prepared you for this job? Give some examples. During a phone interview, it is important to sound upbeat. Practice with a friend. Since you are not in front of the interviewer, your personality needs to shine through. If you sound dull and mundane, the interviewer might get the wrong idea and think you are not interested in the job. Phone interviews are a great way to conduct pre-interviews. They give the candidate some information about the job and the interviewer gets to learn about the candidate. Video interviews are becoming commonplace. They are a great way to conduct interviews in the comfort of one’s home. It is important that even though you are at home you dress the part. Do not show up to an interview looking like you just got out of bed. Imagine you are wearing a great top and a pajama bottom and something happens where you are forced to stand up. This could cost you a chance at the job. Do everything you would do in an in-person interview. Make sure your computer is working and sit in a section of your house that has great lighting. If possible, find a friend to practice with. The more practice you get, the better you will become. Researching behavioral interview questions and getting comfortable answering them will help you during the interview process. Your responses should give the interviewer an idea of how your work product would positively impact the organization. At the end of the day, companies are in it to make money and they want to see how hiring you is going to improve their bottom line. Be likeable and smile. Remember, people tend to want to do business with someone they know, like, and trust. Tashania Morris, MSHRM, ALS, CDF, CPC, started her career as a paralegal. She has over six years’ experience in the legal field specializing in the areas of foreclosure and bankruptcy. She recently completed her master’s degree in human resource management which has equipped her with the tools needed to think strategically and develop creative solutions to problems in the workplace. As a Certified Professional Coach and Career Development Facilitator, she loves all things career and personal development. She is able to recognize people’s skills and abilities and enjoys working with individuals to figure out their “why.” Her mission is to engage, empower, educate, and promote change from within. If you have any questions about any of the articles written, suggestions about something you would like Tashania to write about, or enjoyed reading the article, send her a quick note. You can reach Tashania at Tashania_m@hotmail.com. As I am attempting to find a way to introduce this article on cyber and email security, I just received an email from the "admirable" Dr. Novo Depa. The email contained the following line of text: "I would like to ask your permission to receive the transfer of 33,150,000 dollars, as a close relative of one of our clients who die in plan crash and who the account is currently on standby for reclamation in one of Bank. If you want to treat this matter with me contact me and reply me immediately." Although this scam is a bit obvious as to its malicious intentions, there are several sneaky ones that you should be aware of. Recently it has been brought to NALS’ attention that a member received an email that looked as though it was from her chapter president but, in fact, it was a scammer. The email requested bank account information to transfer funds and ended with an email signature of the chapter president’s name. In light of that, NALS would like to inform you of some ways to protect yourself and those you email. Where a scammer steps, we must leap! If a contact typically does not use email as a primary or typical contact, confirm that it is them. Ask them a security question that only THEY would know or ask them to give you some personal information in order to confirm. A sure way is to pick up the phone and call or text them to check the email's validity. When you receive an email from a trusted source, save that email to your contacts. This will help you differentiate from what you should question and what you can likely trust. A surefire sign to determining if a trusted email account is hacked is if you start being included in mass emails with multiple recipients. Inform the person that their email has been hacked and advise them to change their password. NEVER download an attachment from an unknown source; this opens your computer and hardware to hackers. I have personally received an email from "FedEx" saying I missed a package delivery. The email included an attached compressed folder. I typically will mark these emails as "Junk" and delete them from my system. The reason I know these are scams is because FedEx missed deliveries are in the form of paper notices. Any financial transaction requested out of the blue should ALWAYS be questioned. Oh no! I’ve been hacked or I received a scam email. If you received a scam email, mark it as "Junk" and/or delete it. Do not click links or open attachments. If your email has been compromised, change your passwords to something more secure. Use secure 8-10 character password that includes a mix of upper and lower case letters, numbers, and other symbols, if the system allows. Then notify your contacts that if they receive any more spam emails from your address to let you know. Email and web are wonderful tools that assist us in our jobs and life. It is not something to be afraid of, but we should be cautious on where we click and what information we give out.